Some time ago, I polled readers to find out what are some favorite kitchen gadgets. It turned out to be a treasury of great ideas. 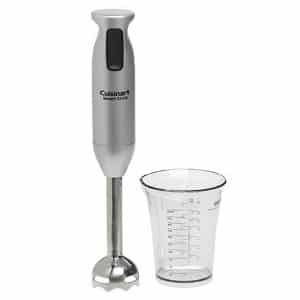 One of my personal favorites is an immersion blender. * We’re not huge fruit eaters in my family (we prefer our veggies! ), so making smoothies most days of the week is not a big deal with this hand-held gadget, and ensures that we get our requisite 2 servings of fruit per day (of course making fruit smoothie and green smoothies is a snap with the Vitamix see below and other high-speed blenders, but those are quite an investment compared with this under-$30 item. I also love that you can just stick it into a pot and blend all or part of a soup rather than transferring hot ingredients to and from a food processor or blender. And last, I use it to grind nuts, a task at which the immersion blender is very efficient with—almost too efficient, as nuts are ground to a powder in seconds. It’s easy to clean; just rinse the blade section, toss it in the drainer, and that’s that. Katie: My new favorite appliance, and I have so many, is my Vitamix. I just got it so I am still in the honeymoon phase of my purchase and am using it everyday. I have made everything from bread to ice cream, soups, and sorbet. I love it and the clean up in it is soooo easy. It basically makes its own dishwasher. Plus I like the fact that the fruits/veggies are whole and not cooked when I put them in to make something so I get all of the vitamins and fiber that makes these jewels so good for my body. So that is my pick of the day. Heather: It’s not that exciting but I have a OXO Good Grips Smooth Edge Can Opener. * It is so nice that the lid does not fall in the can and the edges are smooth, so you don’t get cut. I could not bake without my kitchen aid mixer and my immersion blender (most recent member to my appliances) I didn’t know I could chop nuts with it! Thanks Nava! I have now been inspired to make some banana bread with my mixer and put in some chopped walnuts made from my immersion blender. Yum! Jen: Mine would have to be my KitchenAid Stand Mixer. * I follow a gluten-free diet and it is much easier to make my own breads. Almost tied with that would be my mortar and pestle I inherited from my mother. It is an old pharmacist’s one and does the job of grinding spices and flax seed beautifully. Courtney: I love my salad spinner. * I eat salads daily, and I don’t know what I would do without it (well, yes I do—have wet lettuce in my salads, or start making my salads an hour before I wanted to eat them so that the lettuce could dry)! It was a toss up between the salad spinner and the Vitamix, but since Katie already mentioned the Vita Mix, I had to go with the salad spinner—it may sound silly, but they really are great! Starla: I’m not sure if this is a gadget or an appliance but I could not live without my Cuisinart Food Processor. * As far as a true gadget, I LOVE my bench scraper. * It’s a stainless steel 5” x 5” square with a handle on it. I use it to scoop up anything I’ve just chopped to transfer them to either the soup kettle or skillet. I get up more of the product with this than if I did it with my hands (and it’s more sanitary). It’s also nice to get up dough stuck to the counter after I’ve made pie crust. Mine is very old now but just doesn’t wear out. Geraldine: Of course my food processor gets a lot of use. I’d say a garlic press* is pretty darn cool too. So much more flavor than just chopping garlic, who knew??? Diann: I could not live without my Cuisinart MiniPrep food processor. * It holds just 3 cups and is great for black bean burgers, salsas, grinding oatmeal, and it’s small enough to stay on my countertop. I also love my fancy crinkle cut veggie slicer. Susan: I remember getting my first food processor. It made things like hummus a snap, and even nut butters went well — I had burned out the blender on them. Now the new immersion blender * is so much more flexible, especially for soups. But some of the low tech things are indispensable — my well worn wooden fork (spoons too), the Kitch-a-majig, a cross between slotted spoon, potato masher and pastry blender, and a sturdy garlic press (also for ginger). Frances: Mine is a little bit less fancy than the ones mentioned above, although somewhat similar to the salad spinner. It’s the “twista” which is basically a manual food processor* that comes with 10 different kinds of blades that you exchange. It has the paddles for making thick mixtures, the razor blade for blending….it’s great because you can really accurately gauge the thickness and fineness of what you’re preparing, so you can have chunky capsicums, finely diced or pureed if you wanted. Not only that but it gives me and my partner an arm workout, we alternate arms when we use it so not are we being kind to the environment but we’re getting exercise too! Explore VegKitchen’s other Green Kitchen articles, as well as the wealth of kitchen tips in the entire Healthy Vegan Kitchen area. See more of VegKitchen’s product recommendations in the Product Guide. You will laugh, but I like my corn cob holder. You know, they come in pairs for the ends of your corn on the cob. Anyway, they can be used as an assistant for everything. They are small enough to get into tight places and try cutting your vegetables with your knife and these. You can go faster because your fingers are protected. Cutting the last 2 slices won’t worry you anymore.